National Squirrel Appreciation Day came and went, as it always does, with me in the yard, hiding my nuts, and missing my chance, again, to tell the squirrels of America how much I love them. Sorry, little guys! You’ll have to make do with this, days in the making, a squirrel post so long you may want to bury bits of it to read later. Squirrels are a good subject for pet studies because domesticated squirrels are obviously just pets – although I’m prepared to pretend to be shocked when you tell me about your guard squirrel – and because domesticated squirrels strike most of us as an anomaly. Newspapers periodically run stories on cab drivers and other local characters who pal around with squirrels (a sample), but otherwise, to find a land where the squirrels are still chained and tamed, we might have to visit Southern Italy, where I’m told they’re sold in petshops. Eighteenth-century paintings of children with chained squirrels are not all that uncommon. The Brooklyn Museum has one, the New York Historical Society another, the Museum of Fine arts in Boston still another, and the list scampers on to include one by Thomas Hudson, with a boy whose perhaps too wizened face recalls nothing so much as John Malkovich’s. More are collected in this much-plagiarized blog post. One famous champion of slavery, Robert E. Lee, loathed his sister Mildred’s pet squirrel, named Custis Morgan, while the founders of the country he sought to destroy were themselves also mixed up variously with squirrels: in 1772, Paul Revere himself billed one client for a silver chain for a squirrel, while Benjamin Franklin wrote a mocking epitaph for another, named either Mungo or Skugg. Earlier examples not having to do with America’s Founding Fathers, include Aelbert Cuypt’s Portrait of the Sam Family before the Town of Bacharach (1653), where little Abraham Sam clutches the chain of his little squirrel, and Francesco Montemezzano’s of a woman and hers, in 1575. Later pet squirrels include Bonnie, painted by Joseph Decker in various wild settings, in The Seated Squirrel and another, called either Their Winter Hoard or, outrageously, The Gluttons. The poet Christian Friedrich Hebbel’s squirrel, Lampi (or Schatz), mourned deeply, may be pictured here, living and chained to his kennel. As for the real goods, the medieval pet squirrels, we have enough to assert, with small confidence, that people kept squirrels for pets, with more frequency, per capita, than they do now. We have a fifteenth-century love ring, French or English, whose inside engraving features a woman with a leashed (metaphorical?) squirrel, at the British Museum; or this page from a mid fourteenth-century Quest for the Holy Grail, whose right margin pictures, naturally enough, a squirrel cleverly chained to its pole, perched atop its little squirrel house, thinking, one presumes, about the Arthurian court’s coming doom. A similar squirrel kennel shows up in an early fourteenth-century Flemish Psalter (MS Douce 5), while the Hours of Anne of Bohemia (1382-1384) have a squirrel with its kennel, no pole, and in the Luttrell psalter, an unchained, unkenneled squirrel, wearing a bell (and later, in the same manuscript, a squirrel riding the shoulder of lady in a wagon). The early fourteenth-century Ormesby Psalter also has a lady with a squirrel in her hand, as does one of the Chertsey Tiles, dating to the last decade of the thirteenth century. Even more medieval (and early modern) squirrels, mostly undomesticated, are collected by this extraordinary post. Squirrels, like other small animals, seem to have been kept mainly by women and, in later centuries, children, though we know of plenty of men from the later eighteenth century on not afraid to give squirrels their love: in addition to Hebbel, there’s the pet squirrel in the third volume of Hal Willis’s delirious medievalist novel Sir Roland; there’s also I. W. Sickels, who wrote in 1903 that “the male squirrel is always more or less treacherous,” and observed that a pet squirrel will often hide its nuts “in the pockets of your coat, vest, or pantaloons, or between your collar and neck”; and even John Huston, whose little Pachito, normally a placid chap, once bit the producer Ray Stark. 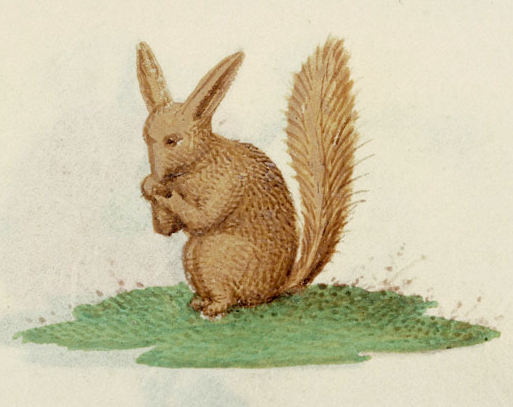 What’s harder to come by, however, are written accounts of medieval domestic squirrels. To be sure, monastic visitation records complain about nuns keeping squirrels, among other animals (for example, Eileen Power, here; or Archbishop Eudes in mid thirteenth-century Rouen, [also here], whose contempt for pets merits nothing less than his being immortalized as an operatic, or Disney, villain). But without easy access to the Acta Sanctorum (thanks CUNY! ), it’s hard to find the stories about squirrels that would be preserved, no doubt, in hagiographic records of grief, trauma, and healing (think of St Cantilupe, who once resurrected a pet dormouse! n5, here). The problem with squirrel research is knowing what to call them. The base form in Latin – sciurus – throws off a mess of possibilities: scira, scuirus, scurulus, scuriolus, quirolus, squiriolus, squiriolis, escorion, escuratus, escurellus, exquirium, squirio, escurellus, aspriolus, esperiolus, espirio, expereol, pirolus, pirulus, pyrolus, speriolus, spiriolus, spiriculus, spirgulus, and asprigulus. I’ve found these mostly through searching the Monumenta Germaniae Historica and Louis Gauchat’s article, below. With no small trepidation, I can also cite cirogrillus, to some, a squirrel, to others, a hedgehog. This proliferation raises a question of just what counts as a Latin word: obviously, despite having learned Latin as a second language, our writers had some freedom with this noun that they don’t have with, presumably, verb endings. Latin may be a deadish language, but through its pile of corpses scampers the ever-transforming squirrel. All that makes these words specifically Latin are that they’re used with a Latin grammar and vocabulary that made it readily distinguishable different from the common tongue (which may nonetheless have used precisely the same word for “squirrel,” unless it was a region that preferred eichhorn, eichörnchen, or acquerna). As fabulous as this is, Gesner might have been wrong, as might everyone who followed. There’s little surprise that no one’s bothered much to correct him, since, in the humanities, the squirrel tends attract no more than its due interest. It may nonetheless be worth noting that, a century ago, Gesner met his match in a skirmish that might be refought, if etymologists see fit, once again, to take up the banner of accuracy. Louis Gauchat’s 1909 “Les noms gallo-romains de l’écureuil” (available in Volume 2, here) calls the “shade tail” origin an “idée bizarre,” and cites as support, “entre autres,” Schader’s 1901 Reallexikon der indogermanischen Altertumskunde (whose later versions you might check for me) (meanwhile, the OED et al. might check the 1903 Universal Cyclopaedia and Atlas). The Reallexikon suggests that the word might come, more naturally, from scéri, fast or agile, while also pointing out the importance of the root preserved in the Slavic véverica (consider the Welsh wiwer, for example), as this element appears in the Anglo-Saxon ácweorna (Gauchat 194). At the least, the OED might hint at some other possibilities! They growe exceeding tame and familiar to men if they be accustomed and taken when they are young, for they runne vp to mens shoulders, and they will oftentimes – it vpon their hands, creepe into their pockets for Nuttes, goe out of doores, and returne home againe, but if they be taken aliue, being olde, when once they get loose, they will neuer returne home againe, and therefore such may wel bee called Semiferi [semi-wild] rather than Cicures. They are very harmeful, and wil eat al manner of woolen garments [and scamper across all manner of power lines], and if it were not for that discommidity, they were sweete-sportful-beastes, and are very pleasant play-fellowes in a house. Olaus Magnus is indeed one source for this, as is, in later years, Carl Linnaeus, who, under sciurus, observes briefly that “Cortice interdum navigat,” and, in later years, Squirrel Nutkin. Olaus’s contemporary Conrad Gesner also remarks on sailing squirrels, and, in my period, we have, in the fourteenth century, Conrad of Megenberg, and, in the thirteenth, Vincent of Beauvais and Thomas of Cantimpré’s roughly contemporary encyclopedias (the later being adapted into Dutch verse: “ende sitter op, alst in een scip ware, / ende metten staerte seyltet over dare”). Here the trail goes cold: I’ve lost my nuts, because earlier medieval works of natural science, either say nothing about sailing (Albert the Great and Hildegard of Bingen), or, shockingly, not the least thing squirrels (Isidore, Bede, Rabanus). Why this story begins to be written down only in the thirteenth century is a mystery that could – and perhaps should – be solved only with a grant, or endowed chair, worthy of this great labor. This entry was posted in MedievalBlog and tagged animals, medieval, pets, squirrels by medievalkarl. Bookmark the permalink.